Residents of the second and third floors of the Aish Hatorah house include three Jewish couples (one of which has a child living with them) and three single people. They pay jointly for utilities, a cleaning service, and certain other amenities while learning how to live as observant Jews. Most of the adults hold jobs outside the house and the three single people, all men in their 20's and 30's, also assist Mr. Karasik in his work as a kashrut supervisor. Mr. Karasik himself leads Jewish-interest tour groups in central and western Ukraine. He also arranges logistics for other groups that wish to do their own touring. Additionally, he teaches in and handles logistics for other short-term programs, including Shabbatonim, for various organizations. Among his other services, continued Mr. Karasik, is kashrut supervision for the Jewish Agency, JDC, and Midreshet Yerushalayim (Conservative movement). He works with hotel kitchen staff in catering kosher events and provides kosher dishes and cutlery for various organizations and events. Eventually, he said he would like to operate a full kosher catering service and possibly manage a kosher catering hall. Reflecting its history as a center for Jewish education activity, the ground floor of the Aish Hatorah facility includes a small synagogue and a well-stocked Jewish library, the core collection of which was provided by JDC. With the help of donors, Mr. Karasik continues to provide hot meals to Jewish elderly in the neighborhood several days each week. He also operates a small store selling discounted kosher food. However, no regular Jewish education programs are conducted in the building. 47. In addition to his responsibilities in Hillel and with other groups, Iosif Akselrud is lay chairman of Limmud in Ukraine. Mr. Akselrud considers his Limmud involvement a natural counterpart to his work in Hillel because both programs attract Jewish young adults. Limmud conferences generally take place over a three-day weekend and may attract as many as 500 people to a program including presentations on Jewish history, culture, religion, Israel, multiculturalism, and other topics of interest. Presenters include professionals as well as laypeople who have acquired experience and expertise in a given area. Some Limmud conferences also include activities for children. 48. Moishe House opened in Kyiv in August 2010, one of 40 such houses worldwide. The goal of the Moishe House organization is development of a young adult-operated Jewish program center that serves as a hub for local Jewish young people in their 20's. A small group of young adults resides in the house or apartment, receiving a rent subsidy and a program budget from Moishe House international headquarters in California. In return for the rent subsidy and program budget, Moishe House residents are expected to operate a variety of programs that attract Jewish young adults. 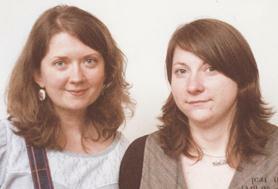 The writer met with three of the four young women residing in the Kyiv Moishe House. 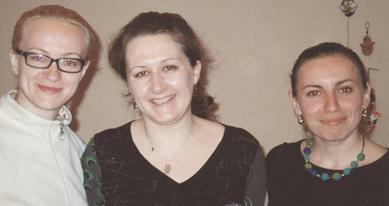 Viktoria Milovanova, at left, is a professional psychologist. Age 31, she is originally from Kirovohrad. Among other work, Viktoria has advised Jewish summer camps and recruited Ukrainian Jewish girls for Israeli religious schools. She is a graduate of Project Kesher pro-grams and has worked for JDC. Marina Bezdenezhnyk, center, is 27 years old and is a risk manager for a local bank. Marina has a graduate degree in finance from a British university and previously worked for a multinational company in the U.K. Originally from Simferopol, Marina also is associated with Project Kesher. She is affiliated with Pro-gressive/Reform Judaism in Kyiv. Lena Kushnir, right, is 24 years old and identifies as Orthodox. Lena is the founder of Moishe House, having heard about it as a participant in the Paideia program in Stockholm. She has been employed by the Ukrainian Vaad, the Israel Culture Center in Kyiv, and the Brodsky synagogue. The Moishe House residents operate seven events every month. Each resident leads one or two of these events, works as assistant leader in another one or two events, and serves as an official observer in one or two events. Each also is free of responsibilities for one or two events. The young women believe that rotating tasks in this manner permits each resident to "own" certain events and become enmeshed in them. Similarly, each resident learns from observing others and is guaranteed some free time. Examples of Kyiv Moishe House events include: Shabbat and other holiday celebrations and observance, lectures by local scholars and visiting experts on Jewish subjects, intellectual games (trivia contests) on Jewish themes, Israeli movies (with Russian subtitles), Jewish-theme arts and crafts, and participation as a group in Kyiv Jewish community events, such as Purim celebrations and Israel Independence Day. Participants are drawn from social networking sites, and the residents endeavor to build affinity groups of compatible people. Almost all publicity is Internet-based, and some events are marketed to specific groups of people, e.g., to English-speakers for a lecture by a visiting American. They are planning to add some charitable work to their programming, the young women said. The three residents stated that Moishe House is non-political and non-denominational among Jewish religious streams. They have worked with both Orthodox and Progressive rabbis, and are eager to become acquainted with the new Masorti/Conservative rabbi in Kyiv. They cooperate with all Jewish organizations, including the Jewish Agency, JDC, Hillel, and Project Kesher. In response to a question, the three women said that participants are free to form their own opinions about Israel (and aliyah), but that anti-Zionist/anti-Israel activity is not tolerated. 49. JAFARI (Jewish safari) is an organization that creates Jewish cultural and educational programs for the Kyiv Jewish population. Its primary event is a mobile Jewish scavenger hunt that operates every other week with a hiatus during the coldest winter months. Leaders Masha Pushkova and Marina Lisak explained that five or more people participate as a team in a vehicle, and another team member remains at home doing related Internet research. The hunt begins several hours after the end of Shabbat and usually continues for four hours, although a different version can be arranged for two hours. The late hours of competition, said the two women, assures that traffic will be relatively light. Up to 20 cars compete in each hunt, seven of them regularly and the others on an occasional basis. Most individuals are young adults, said Ms. Pushkova and Ms. Lisak, but family groups also participate. Young couples with small children are welcome if the youngsters are seated in appropriate child seats. Religiously-observant Jews are among the competitors. Participants pay a fee of 200 hryvnia (approximately $25) per car to cover expenses. Information about the hunts is transmitted through social networking Internet sites and by word of mouth. Most competitions are structured around a specific theme, such as a particular Jewish historic figure or event. Participants are given a set of 10 envelopes to be opened in a numbered sequence; each envelope contains a clue, often written in a humorous or ironic style, about a specific building or monument related to the theme. The designated Internet researcher at home searches for information on relevant sites and phones or texts data to friends in the car. Upon reaching the building or monument, participants call or text information to the organizers that verifies identification of the target. The organizer may ask for certain details about the site. Those responding correctly are authorized to open the next envelope and proceed in the search. Occasionally, said the two women, colleagues are posted at a specific site to check that the cars did indeed reach the intended target. A series of competitions during the past year was structured around Jewish holidays. For Pesach, said Ms. Pushkova and Ms. Lisak, the theme was Let My People Go; competitors had to find the homes of certain Kyiv refuseniks. Marina Lisak, left, is an investment manager. Masha Pushkova, right, was a philosophy major in university and now teaches Hebrew and is active in various Jewish cultural endeavors. The two women studied Hebrew in JAFI ulpans and now create and manage popular Jewish cultural events. Following the competition, participants meet at the Aroma café  for coffee, an educational presentation (including slides) about the theme, and a summary of competition results. Small souvenir-type prizes are given to the victors. Competitors often are joined at the Aroma by friends. In addition to Jewish scavenger hunts, the two women also organize secular scavenger hunts, various Jewish quizzes and games, and activities for Jewish camps, Limmud, and other organizations. They operate a private Hebrew-language ulpan, often using games as teaching tools. At the time that the writer met with the two women, they were teaching/supervising three different ulpan groups, each enrolling four to 10 people. Ms. Pushkova also is a tour guide specializing in Jewish Kyiv; she works with Israelis, providing information in Hebrew and Russian. Ms. Lisak and Ms. Pushkova also have organized a leadership development course that is used to train madrichim for the Israel Culture Center Israeli Scouts program. The two women noted that such courses must address different levels of readiness within the Scouts group; some Scouts, they said, may be day school students who already have had leadership training as part of their school curricula. The principal income of the two women derives from their careers as event planners, working mainly for secular companies. Their clients include Fortune 500 companies with Ukraine operations. The Aroma café in Kyiv is one of a number of international cafés modeled on, and owned by, the popular Aroma cafés in Israel.